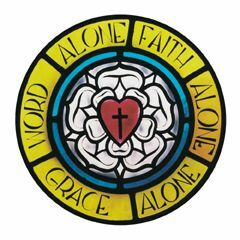 Our Lutheran Theology | The Old Adam Lives! St Stephen. Thank you for continuing to provide these programs on your blog. They are refreshing and very helpful. Please pass along my thanks to St Mark. Thanks, so much, St. David! God’s peace is also with you, my brother in Christ. I will pass along your thanks to Pastor Mark when he returns from the frozen environs of Wisconsin. Indeed, I loved listening to the sermon. Impressive, that idea of God’s intention to save mankind from His wrath through the gospel that reveals His mercy, unfolding itself (the intention, that is) – more and more – from Genesis to Revelation. Just my own experience on this. To me, this is not “dead Scripture”, since soon after the death of our son as I was praying, the Lord suddenly “arose” in my mind (spirit) and showed me our dear little son whom Jesus caressed so much, that the baby chortled and dissolved into giggles. [Note: Living in the Spirit that indwells us enables us to see and enter the kingdom of heaven, cf. Jn 3:3-5]. Aha! Was his son baptized? Certainly not. Of course I remember you, Susanne! Nice to hear from you, friend. You are so right. Our Lord is a gracious a merciful God who loves the little ones. They are born in need of Baptism, as we all are. But sometimes circumstances are such that Baptism cannot happen. Our Lord knows this. I trust that one day I’ll have a chance to meet you…at least in Heaven. And you can introduce me to your son. His peace and blessings to you, as well, Susanne. I’ll definitely go to that link and check it out, soon.